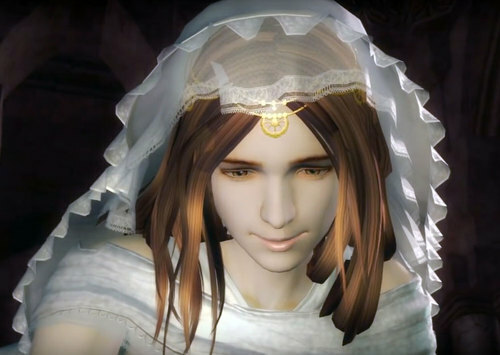 Gwynevere is the only daughter of Lord Gwyn, making her the Princess of Sunlight (she calls herself Queen, but it's actually mistranslated from the original Japanese). She appears as a giant woman resting in her chamber in Anor Londo but it is actually an illusion, created by her brother, Gwyndolin. The real Gwynevere is currently not in Lordran and is married to the Flame God Flann. If the illusion is attacked and destroyed, the city will turn dark and certain other NPCs will become hostile. This also reveals that most enemies in the city are also illusions. Gwynevere is meant to appear as a comforting, motherly figure. She appears as a fair lady with brown hair and a kind face. 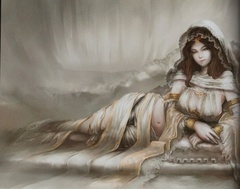 The light shines brightly from behind Gwynevere's figure, and she is dressed in fine white cloth with golden bracelets and jewelry. Hatsuyama: Can I ask aboutGwynevere, because compared to the other female charters she's very different, almost glamorous. Miyazaki: You don't like the design? Hatsuyama: No, I just wanted to know what the original idea behind her was. Otsuka: As a fan of the character, I'd be interested to hear that too. Miyazaki: The truth is that I just wanted to make a really big woman. I think it was a Fujiko F. Fujio manga, (Yasuragi no Yakata, literally Tranquil Mansion) in which there was a company president who joins an exclusive club to escape his stressful work life, and there's this giant woman who takes care of the club members, almost like a mother… don't you think that's just a perfect situation? A giant, considerate, caring woman. The kind we all lost when we grew up; that's what I wanted to make. Originally I wanted to put a mouth in the palm of her hand and we made all of the animations, but it didn't make it into the final game. Talking of glamour, her breasts have nothing to do with me, they happened without my knowledge. It's all the artist's fault. I think I mentioned it earlier but I always seek a certain refinement in all my designs. Miyazaki: Yes, but the artist had such a happy look on his face, I didn't have the heart to stop him. O chosen Undead. I am Gwynevere. Daughter of Lord Gwyn; and Princess of Sunlight. Since the day Father his form did obscureth, I have await'd thee. I bequeath the Lordvessel to thee. And beseech thee. Succeed Lord Gwyn, and inheriteth the Fire of our world. Thou shall endeth this eternal twilight, and avert further Undead sacrifices. Once living, now Undead, and a fitting heir to father Gwyn thou art, O chosen Undead And beseech thee. A grave and arduous test of mettle, yea, it shall be. Indeed we had felt the warmth of Fire, its radiance, and the life it sustaineth. Without Fire, all shall be a frigid and frightful Dark. Please. Father's role thou should assume, and inheriteth the Fire of our world. Kingseeker Frampt, the primordial serpent, shall guideth thee. Hereafter, I, Gwynevere, shall serveth as thine guardian. If thou so needest, I shalt devote all to thine safety. May thou be one with the sunlight for evermore. Now thou shall go forth, chosen Undead. May thou be one with the sunlight forevermore. Ring of the Sun Princess This ring is granted to those who enter a Covenant with Gwynevere, daughter of Lord Gywn and the Princess of Sunlight. This slightly warm ring boosts the synergy of miracles. Silver Knight Set Armor of the Silver Knights who protect Anor Londo. When Lord Gwyn departed to link the Fire, his knights split into two groups. The Silver Knights remained in the forsaken capital in the service of their goddess. Silver Knight Shield Shield of the Silver Knights of Anor Londo. A flowing canal is carved deep into its face. The Silver Knights stayed behind in Anor Londo to defend the illusory goddess, and their shields are blessed with her divine protection. Divine Blessing Holy water from Goddess Gwynevere. The Goddess of Sunlight, Gwynevere, daughter of the great Lord of Sunlight Gwyn, is cherished by all as the symbol of bounty and fertility. Darkmoon Blade Covenant Ring Ring granted to those bound by the Darkmoon Blade Covenant. Gwyndolin, all too aware of his repulsive, frail appearance, created the illusion of a sister Gwynevere, who helps him guard over Anor Londo. An unmasking of these deities would be tantamount to blasphemy. Darkmoon Seance Ring This ring is granted to adherents of Gwyndolin, Darkmoon deity and last born of Gwyn, Lord of Sunlight.